Our mission is to continually innovate and evolve medical devices that help contribute to human welfare and advance the field of gastroenterology. We embrace the changing healthcare environment and strive to offer global solutions to improve the quality of life and cost efficiencies while maintaining dignity and respect for all shareholders, employees and customers. 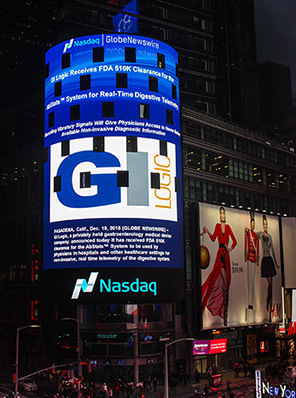 GI Logic, part of the Alpha Logic Group, is a Southern California-based company specializing in the design, manufacture and distribution of biosensors and related medical technologies crafted specifically for the reading and analysis of gastrointestinal activity. Gastrointestinal (GI) disorders are highly prevalent in both inpatient and outpatient settings. A recent NIH-commissioned burden of illness study revealed that there are over 70 million ambulatory care visits every year with a GI disorder listed as the first diagnosis. This number swelled to over 100 million visits when including GI disorders anywhere on the diagnosis list – the equivalent of nearly 36,000 outpatient visits per 100,000 residents in the U.S.
GI disorders have enormous direct and indirect societal costs. The total direct cost of care for GI disorders is estimated at $100 billion a year. Add the considerable indirect costs and the total exceeds $140 billion. With the aging of the American population and the rising incidence of obesity, it is certain that the economic impact GI disorders will burgeon over the next decade and beyond. Against this background, GI Logic was created to address an urgent need for convenient, low cost, sensor systems that can be deployed rapidly in the hospital, clinic and home for diagnosis of digestive disorders. These sensor systems must provide network communication capability for both local area mobile computing devices as well as communication to remote assets. Doctors have traditionally relied on either the basic capabilities of a stethoscope or on invasive methods to diagnose and treat increasingly common GI disorders. Through innovation and research, GI Logic aims to develop the technology to help them improve patient care and advance the field of GI medicine. As this company profile from MedTech Strategist highlights, we’re at the forefront of the Digital Biomarker revolution. We work with engineers, regulatory experts and some of the top GI medical professionals to develop and test new technology and ensure all our products meet the needs of doctors, hospitals and patients. Learn More about the people who help develop GI Logic technology. GI-Logic, AbStats and AbStats – The New Vital Sign are all registered trademarks of Alpha Logic, Inc.